For other uses, see South Africa (disambiguation). The first European people to come to South Africa were Portuguese explorers. In 1487, Bartolomeu Dias found what he called the "Cape of Storms". The king of Portugal changed it to "Cape of Good Hope". He called it this because the cape gave the Portuguese a new chance to find a sea route to India. In 1652, Jan van Riebeeck colonized the Cape. He started the camp for the Dutch East India Company. This was so that they could give fresh food to ships on their way to the south of Asia. There were very few native people living in the Cape. Because of this, slaves were brought from Indonesia, Madagascar and India to work at the colony. In 1795, Great Britain took the Cape from the Dutch East India Company, to stop France from taking it. The British gave it back in 1803 but then annexed the Cape in 1807 when the Dutch East India Company went bankrupt. Diamonds were found in South Africa in 1867. Gold was found in 1884. This made a great number of people to come to South Africa from Europe. They were hoping to make money. The First Boer War happened in 1880-1881. The war was between the British and the Boers Republics. At that time, the British had the Cape. The Boer Republics were established when Dutch settlers moved north in the Great Trek. The British lost the war and came back 8 years later in 1899. They won this Second Boer War in 1902. The British had brought many more soldiers the second time. The Boers had no chance of winning. 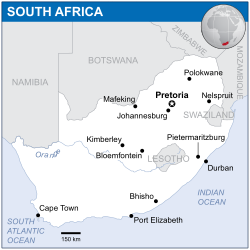 On May 31, 1910 the Union of South Africa was made from the Cape and Natal colonies. It was also made from Orange Free State and the Transvaal. These were two Boer Republics. South Africa is found at the southernmost region of Africa, with a long coastline that reaches more than 2,500 km (1,553 mi) and along two oceans (the South Atlantic and the Indian). At 1,219,912 km2 (471,011 sq mi), South Africa is the 25th-largest country in the world and is almost the size of Colombia. Njesuthi in the Drakensberg at 3,408 m (11,181 ft) is the highest part in South Africa. The back of South Africa is a big and flat. It is a very populated scrubland, the Karoo, which is drier towards the northwest along the Namib desert. The eastern coastline however, is well-watered, which makes a climate kind of like the tropics. To the north of Johannesburg, the altitude drops beyond the escarpment of the Highveld. 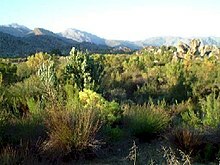 It then turns into the lower lying Bushveld, an area of mixed dry forest and a lot of wildlife. East of the Highveld, beyond the eastern escarpment, the Lowveld reaches towards the Indian Ocean. It has mostly high temperatures, and is also the location of subtropical agriculture. South Africa has a mostly temperate climate. It is surrounded by the Atlantic and Indian Oceans on three sides, and is located in the climatically milder southern hemisphere. Average elevation is higher towards the north (towards the equator) and further inland. Because of this varied topography and oceanic influence, different parts of South Africa have different climates. There is a desert in the southern Namib in the farthest northwest and subtropical climate in the east along the Mozambique border and the Indian ocean. From the east, the land quickly rises over mountains towards the back plateau known as the Highveld. Even though South Africa is thought as semi-arid, there is a difference in climate as well as topography. The southwest has a climate similar to that of the Mediterranean with mild, moderately wet winters and hot, dry summers. This area also makes much of the wine in South Africa. This region is also mostly known for its wind, which blows almost all year. The wind can sometimes be severe when passing around the Cape of Good Hope mostly gets bad for sailors, making many shipwrecks. Further east on the south coast, rainfall falls more evenly throughout the year, making a green landscape. This area is popularly known as the Garden Route. The Orange Free State is mostly flat, because it lies in the center of the high plateau. North of the Vaal River, the Highveld becomes better watered and does not get subtropical heat. Johannesburg, in the center of the Highveld, is at 1,740 m (5,709 ft) and gets a yearly rainfall of 740 mm (29.9 in). Winters in this region are cold, although snow is rare. South Africa is ranked sixth out of the world’s 17 megadiverse countries, with more than 20,000 different kinds of plants, or about 10% of all the known species of plants on Earth, making it very rich in plant biodiversity. The most common biome in South Africa is the grassland, mostly on the Highveld. This is where grasses, low shrubs, and acacia trees, mostly camel-thorn and whitethorn are more common then plants. Plants become even more less common towards the northwest. This is because of low rainfall. There are many species of water-storing plants like aloes and euphorbias in the very hot and dry Namaqualand area. The grass and thorn savanna turns slowly into a bush savanna towards the north-east of the country, with more thick growth. There are many numbers of baobab trees in this area, near the northern end of Kruger National Park. 😢🤩❤️ South Africa's economy is divided. It is divided between First World and Third World standards. The developed part of the economy is similar to that of most nations with wealth (for example, Britain or Australia). The rest of the economy is closer to that of poor nations, such as the Democratic Republic of the Congo. The main companies in South Africa are mining (mostly for gold and diamonds), car making, and service industries, such as insurance. Unemployment is very high. Income inequality is about the same as Brazil. During 1995–2003, the number of older jobs went down. Informal jobs went up. Overall unemployment got worse. The average South African household income went down a lot between 1995 and 2000. As for racial inequality, Statistics South Africa said that in 1995 the average white household earned four times as much as the average black household. In 2000 the average white family was earning six times more than the average black household. The action policies have seen a rise in black economic wealth. There is a developing black middle class. Other problems are crime, corruption, and HIV/AIDS. South Africa suffers from mostly heavy overall regulation compared to developed countries. . Restrictive labor rules have added to the unemployment weakness. South Africa is a nation of about 50 million people of diverse origins, cultures, languages, and religions. The last census was held in 2001 and the next will be in 2011. Statistics South Africa had five racial categories by which people could classify themselves, the last of which, "unspecified/other" drew "not needed" responses, and these results were not counted. The 2009 middle-year estimated figures for the other categories were Black African at 79.3%, White at 9.1%, Colored at 9.0%, and Asian at 2.6%. Even though the population of South Africa has grown in the past decade (mostly because of immigration), the country had an yearly population growth rate of −0.501% in 2008 (CIA est. ), counting immigration. The CIA thinks that in 2009 South Africa's population started to grow again, at a rate of 0.281%. South Africa is home to an estimated 5 million illegal immigrants, counting about 3 million Zimbabweans. A series of anti-immigrant riots happened in South Africa beginning on 11 May 2008. 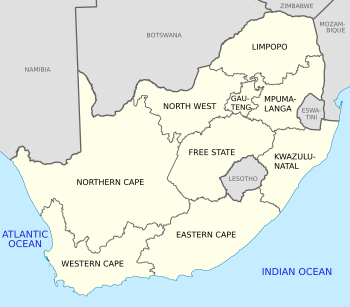 South Africa is divided into 9 provinces. The provinces are in turn divided into 52 districts: 8 metropolitan and 44 district municipalities. The district municipalities are further divided into 226 local municipalities. It may be suggested that there is no single South African culture because of its ethnic diversity. Today, the diversity in foods from many cultures is enjoyed by all and marketed to tourists who wish to taste South African food. Food is not the only thing, music and dance is there too. South African food is mostly meat-based and has spawned the South African social gathering known as a braai, or barbecue. South Africa has also developed into a big wine maker. It has some of the best vineyards lying in valleys around Stellenbosch, Franschoek, Paarl and Barrydale. South Africa is the only Western country of Africa. Most South African blacks still have poor lives. It is among these people, however, that cultural traditions live most strongly. This is because blacks have become urbanised and Westernised, much parts of traditional culture have fallen. Urban blacks normally speak English or Afrikaans in addition to their native tongue. There are smaller but still important groups of speakers of Khoisan languages who are not in the eleven official languages, but are one of the eight other officially recognized languages. Members of middle class, who are mostly white but whose ranks are growing numbers of black, colored and Indian people, have lifestyles similar in many ways to that of people found in Western Europe, North America and Australasia. Members of the middle class often study and work from foreign countries for greater exposure to the markets of the world. According to the 2001 national census, Christians accounted for 79.7% of the population. 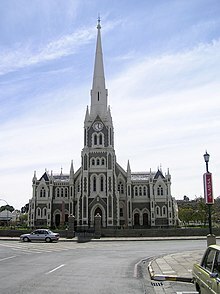 This has Zion Christian (11.1%), Pentecostal (Charismatic) (8.2%), Roman Catholic (7.1%), Methodist (6.8%), Dutch Reformed (6.7%), Anglican (3.8%); members of other Christian churches accounted for another 36% of the population. Muslims accounted for 1.5% of the population, Hinduism about 1.3%, and Judaism 0.2%. 15.1% had no religious affiliation, 2.3% were other and 1.4% were unspecified. South Africa's most liked sports are soccer, rugby union and cricket. Other sports that are popular are swimming, athletics, golf, boxing, tennis and netball. Soccer is the most liked among youth. There are other sports like basketball, surfing and skateboarding that are becoming more liked. Famous boxers from South Africa are Baby Jake Jacob Matlala, Vuyani Bungu, Welcome Ncita, Dingaan Thobela, Gerrie Coetzee and Brian Mitchell. There are football players who have played for major foreign clubs. Some of them are Lucas Radebe and Philemon Masinga (both were of Leeds United), Quinton Fortune (Atletico Madrid and Manchester United), Benni McCarthy (Ajax Amsterdam, F.C. Porto and Blackburn Rovers), Aaron Mokoena (Ajax Amsterdam, Blackburn Rovers and Portsmouth), Delron Buckley (Borussia Dortmund) and Steven Pienaar (Ajax Amsterdam and Everton). South Africa made Formula One motor racing's 1979 world champion Jody Scheckter. Famous current cricket players are Herschelle Gibbs, Graeme Smith, Jacques Kallis, JP Duminy and more. Most of them also participate in the Indian Premier League. South Africa has also made many world class rugby players. Some of them are Francois Pienaar, Joost van der Westhuizen, Danie Craven, Frik du Preez, Naas Botha, and Bryan Habana. South Africa hosted and won the 1995 Rugby World Cup at their first try. They won the 2007 Rugby World Cup in France. South Africa was only allowed to participate from 1995 since the end of Apartheid. It followed the 1995 Rugby World Cup by hosting the 1996 African Cup of Nations. It had the national team, 'Bafana Bafana,' going on to win the tournament. It also hosted the 2003 Cricket World Cup. and the 2007 World Twenty20 Championship. Both of them were a great success. In 2010, South Africa became the first African nation to host the FIFA World Cup. The national team has competed in three World Cups. It bid for the right to stage the 2004 Olympic Games, but finished third to Athens. South Africa is also well known for their cricket team. They are right now the world's number one in test match cricket. The main schools span the first seven years of schooling. In the age of Apartheid, schools for blacks were subject to judgment through inadequate funding and so forth. Instruction can take place in Afrikaans as well. Public payment on education was at 5.4% of the 2002-05 GDP. South Africa's military is the most powerful in southern Africa. South Africa spends more on its military than any of its neighboring countries do. They have very advanced weapons as a result. South Africa used to have nuclear weapons, but they were taken apart in 1993. ↑ The Khoi, Nama and San languages, South African Sign Language, German, Greek, Gujarati, Hindi, Portuguese, Telugu, Tamil, Urdu, Arabic, Hebrew, Sanskrit and "other languages used for religious purposes in South Africa" have a special status (Chapter 1, Article 6 of the South African Constitution). ↑ "The Constitution". Constitutional Court of South Africa. Retrieved 3 September 2009. ↑ "Principal Agglomerations of the World". Citypopulation.de. Retrieved 30 October 2011. ↑ "Mid-year population estimates 2015" (PDF). Statistics South Africa. Retrieved 11 August 2015. ↑ Census 2011: Census in brief (PDF). Pretoria: Statistics South Africa. 2012. ISBN 9780621413885. Retrieved 12 January 2013. ↑ 6.0 6.1 6.2 6.3 "South Africa". International Monetary Fund. Retrieved 26 April 2015. ↑ "Gini Index". World Bank. Retrieved 2 March 2011. ↑ "Country Comparison". World Factbook. CIA. ↑ "Biodiversity of the world by countries". ↑ Plants and Vegetation in South Africa, South Africa Online Travel Guide. ↑ 12.0 12.1 "Post-Apartheid South Africa: the First Ten Years - Unemployment and the Labor Market" (PDF). IMF. ↑ "Black middle class boosts car sales in South Africa: Mail & Guardian Online". ↑ Race against time. The Observer. January 22, 2006. ↑ "Economic Assessment of South Africa 2008". OECD. ↑ 17.0 17.1 Census 2001, Statistics South Africa. ↑ "Midyear population estimates: 2009" (PDF). Statistics South Africa. Retrieved 23 February 2010. ↑ "Anti-immigrant violence spreads in South Africa, with attacks reported in Cape Town". ↑ "Escape From Mugabe: Zimbabwe's Exodus". ↑ "More illegals set to flood SA". ↑ "South African mob kills migrants". BBC. 12 May 2008. Retrieved 19 May 2008. ↑ Barry Bearak (23 May 2008). "Immigrants Fleeing Fury of South African Mobs". New York Times. Retrieved 5 August 2008. ↑ Stats in Brief, 2010 (PDF). Pretoria: Statistics South Africa. 2010. p. 3. ISBN 978-0-621-39563-1. ↑ Mid-year population estimates, 2011 (PDF) (Report). Statistics South Africa. 2011. ↑ "Black middle class explodes". FIN24. 22 May 2007. ↑ "South Africa - Section I. Religious Demography". U.S. Department of State. Retrieved 15 July 2006. This page was last changed on 11 April 2019, at 17:34.